Welcome to your subscriber profile page. You may use this page at anytime to change or update the information you have provided us. Are your personal details below correct? If not, please take a moment to update your details. Assoc Prof. Col. Commodore. Constable. Dr. Father. Hon. Lady. Lord. Madam. Major. Master. Mesdames. Messrs. Miss. Monsignor. Mother. Mr. Mr & Mr. Mr & Mrs. Mrs. Ms. Pastor. Prince. Princess. Prof. Rev. Senator. Sir. Sister. Yes, I am interested to help raise awareness for diabetes. Please register me as a possible media talent for Diabetes Victoria’s awareness campaigns and media activities. Simply subscribe to anyone of the below, remember you can change your preferences at anytime. Diabetes Victoria runs a range of events including the Diabetes Expo. Checkout the Diabetes Victoria Events calendar to find out more. 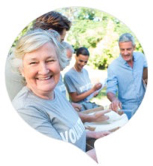 Diabetes Victoria holds over 60 Peer Support groups around Victoria. Click here to find out more. Your donations help run kids camps and support diabetes research. We can collect clothing donations from your home. As a member, you can receive free health advice to help manage your diabetes.